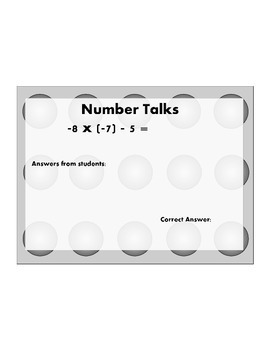 Here is a PDF set of 20 number talk problems I plan to use with my beginning of the year 8th graders. It may also be great for mid to end of the year 7th graders. 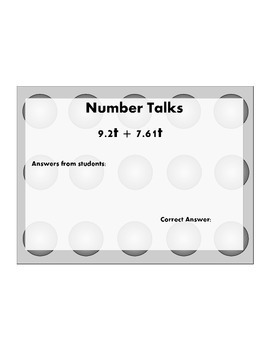 Number talks are done WITHOUT pencil, paper, or calculators. 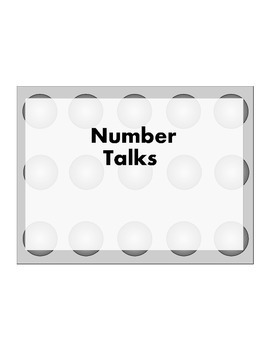 Number talks are a great way to build math sense and the ability to do mental math. My kids LOVE number talk time. Skills included in these 20 problems are adding with variable, solving for x in an equation, expression with negative numbers, division of fractions, area of shapes, missing angle measures in triangle and other geometric figures, absolute value, scientific notation, squares and cubes, and square roots. 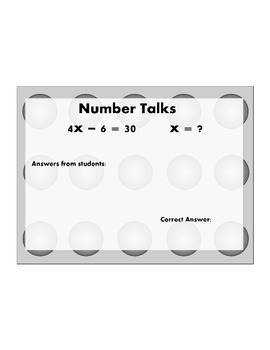 If you are not sure of the rules of a number talk, just google for resources on that! I do 2 a week, so this will be enough for 1 9 week. I will have more sets later. Answer key is included.